We are a small, friendly church with a Sunday attendance of about 25 and we are always looking for new members of all ages. So why not give us a try? Most Sundays the Eucharist is celebrated at 9.30am using the 1982 Scottish Liturgy and a variety of traditional and modern hymns. On the 4th Sunday of the month we hold a joint communion service at 11.00am, led alternately by one of our clergy or a Methodist minister. You are warmly invited to coffee in the Crush Hall after the morning service every Sunday. Also on most 4th Sundays we meet at 6.00pm for Sunday@Six, worship in a variety of styles led by members from both congregations and the wider community. Sundays@Six during 2015 included a Taizé worship, a Methodist ‘Love Feast’, our now annual Café Church (an evening of summer praise with the choir and a ukelele orchestra), a harvest meal with a talk by Norman Liddle of the Scottish Bible Society on “The Land of a Thousand Hills”, a moving account of a pilgrimage to Santiago de Compostela, choral evensong on St Cecilia’s Day and a candle-lit Nine Lessons and Carols. There are occasional variations in this pattern of worship, and other services are held at appropriate times of the year, especially at Christmas and in Holy Week, so we encourage you to click this link for details, or use the “What’s on now” icon. 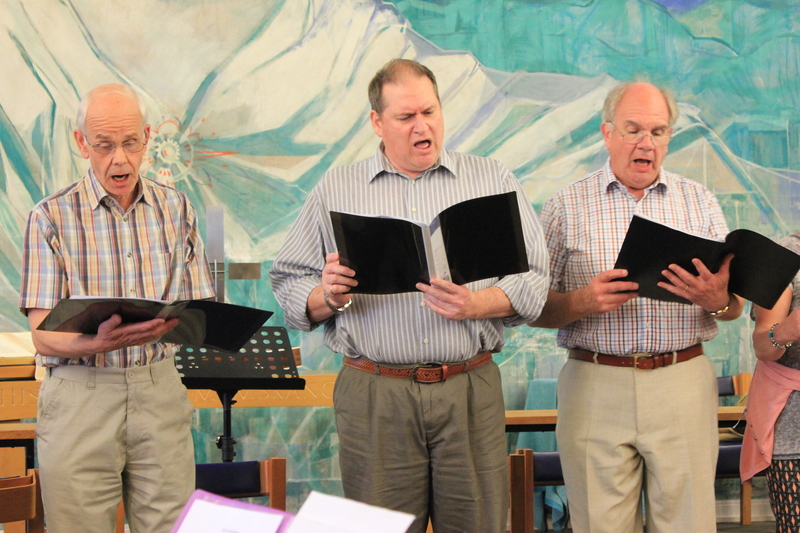 The St Margaret’s Choir men enjoy Summer Praise! We have a small four-part choir that sings a setting and occasional anthems at the Sung Eucharist and leads the congregation in the hymn singing, and also participates in Sunday@Six. 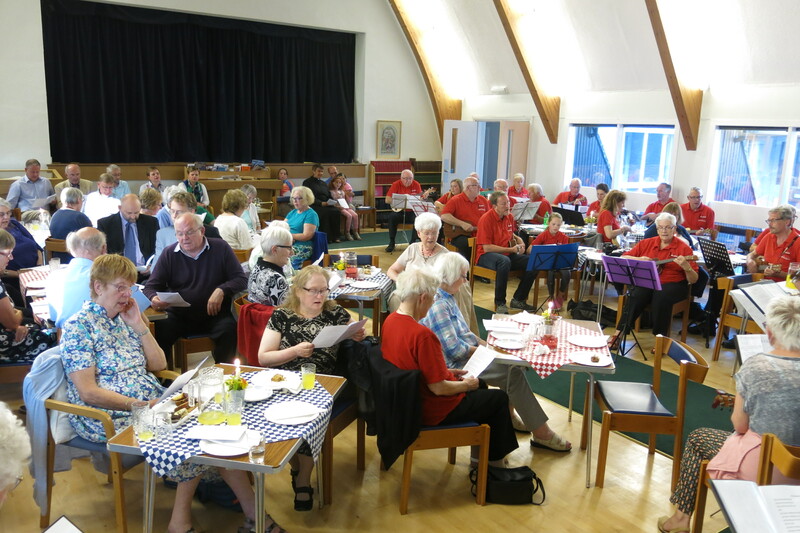 The choir meets for practice in the Church Lounge on most Fridays from 7–8pm and would welcome new members who are able to attend services and practices on a regular basis. If you are interested, please contact Sue Masson (phone 01383 824887 or email susan.masson@nullbtinternet.com). In recognition of the debt owed to both congregations, we contribute financially both to the Methodist Church and to Holy Trinity, Dunfermline, the latter towards the Rector’s stipend and travel expenses. We also contribute approximately 15% of our income to provide for the Bishop and all the costs of administering the diocese. We are group members of the Scottish Episcopal Church Mission Association, and contribute to the Bishop’s Annual Lent Appeal and the SEC Provincial Community Fund through retiring offerings. We also donate about 10% of our regular giving to charities. Those selected for 2015 were: the Royal School of Church Music 70th Anniversary Appeal, Mission Aviation Fellowship Scotland, and Marie Curie Scotland. Our giving in 2015 also included the Mission to Seafarers, the Scottish Bible Society and the Nepal Earthquake Disaster through the Disasters Emergency Committee for relief work in Nepal. In addition, the collection taken at the Christmas Carol Service is for Children’s Hospice Association Scotland (CHAS).